My family love strudels. They love anything with apples in it. 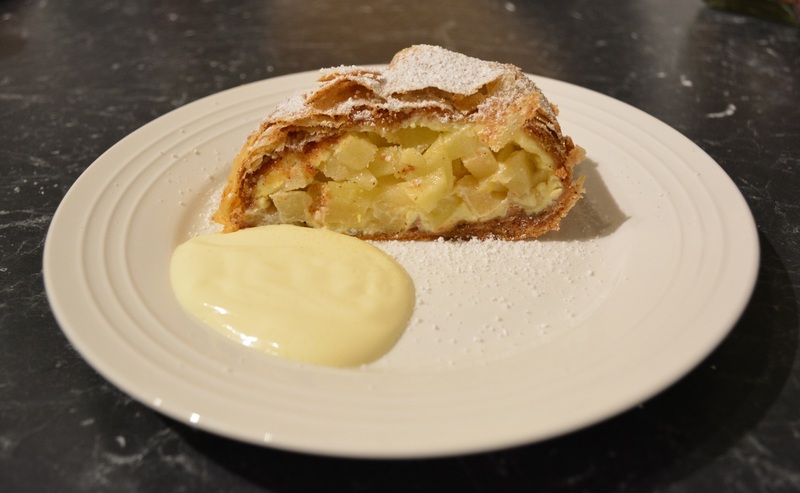 So when you make an apple strudel you know you have a winning dessert in the house. 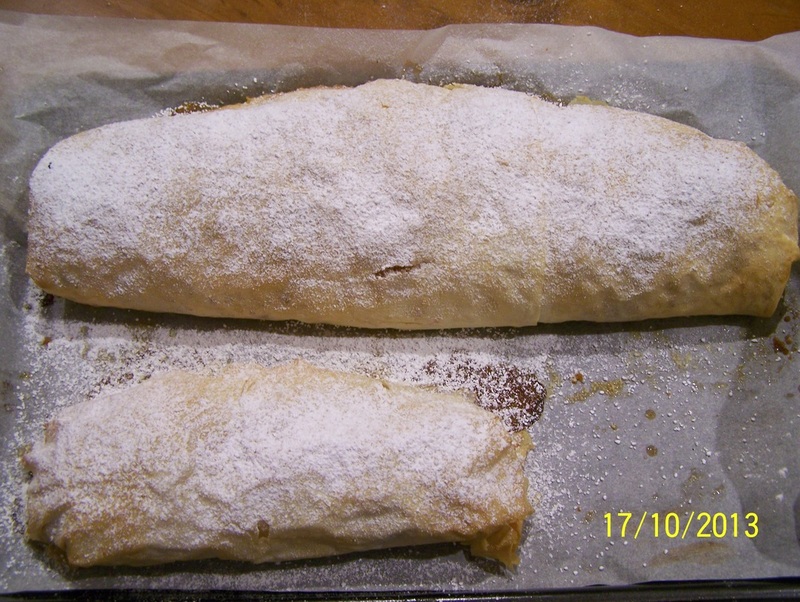 This strudel is full of flavour, the apples are delicious, they just start to soften, but keep their shape, the cream cheese is wonderful addition and the pastry is so crisp. And the best thing is, it is not difficult to make. I made this the other day for my husbands friends, and although I liked it a lot, I needed to make a small change to the original recipe. With the change, we now completely love this dessert. For filo pastry, I like to use the one you can find in the refrigerator section of the supermarket, not the frozen one. Now I use 4 large apples, this adds extra apples, which we love, but it does make it really hard to roll up. If you are a first timer, make it with 4 medium apples, until you get used to rolling it up. 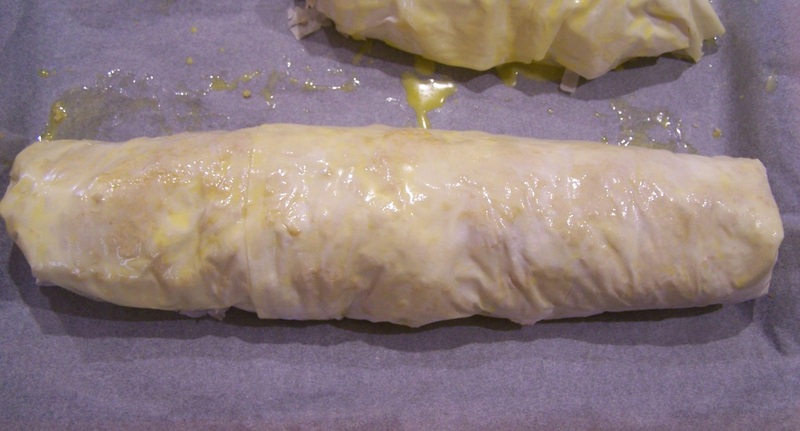 Also, use the baking paper to help you roll the strudel up. The filo is quite flaky and can tear. If it does, once you have rolled it up, just butter up another sheet of filo and cover any torn bits. I used cream cheese here, but ricotta works great here also. One of my kids does not like cheese so I make a small cheese free version for him and he loves it. I have to say, the cream cheese, although I love it, can easily be omitted here, it tastes great just with apples. Put the sliced apple, sugar, lemon rind and lemon juice in a large bowl, toss to combine. Combine the extra sugar, cinnamon and the almond meal in a small bowl. Stir to combine. In a medium sized bowl, mix with a spoon or an electric beater the cream cheese and the icing sugar. Place a sheet of baking paper on a clean work surface. Put the pastry on a clean work surface and cover with a damp tea towel. Place one sheet of the filo onto the baking paper, cover the remainder with your damp tea towel. Brush the sheet of filo lightly with the melted butter. Sprinkle over 2 heaped tablespoons of the almond mixture. Place on another sheet of filo, brush with butter, then sprinkle over another 2 heaped tablespoons of the almond mixture. Continue layering with pastry, butter then almond mixture, ending with 8th sheet of pastry. Spread the cream cheese thinly onto the filo, leaving a 3cm border around the edges. Be very gentle here as the filo tears easily, you could pipe it on if you preferred. Place the apple mixture evenly 5cm in from the edge of one long side of the pastry, leave a 2cm border on each short side (don't add the juice from the apples). Fold in the ends and roll up firmly. (Use the baking paper to assist the rolling). You will only get to roll this once, and the ends just meet. Place the strudel with the baking paper, seam side down, on the prepared tray. If your pastry has torn, here you can fix that by just buttering up another sheet of filo and sticking it on. If your ends aren't closed, it doesn't really matter, but you can also cover the ends with some more filo. Brush the top with some more melted butter. Bake for 40 minutes or until golden on top and the apple is tender. The little one is a cream cheese free version, as my son doesn't like it. Cool slightly, then dust with icing sugar. Serve sliced (serrated knife works best) with whipped cream or a dollop of double cream or with vanilla ice cream.